If you’re following along with our Advent series, you can find the original post here, and the Week 2 overview here. 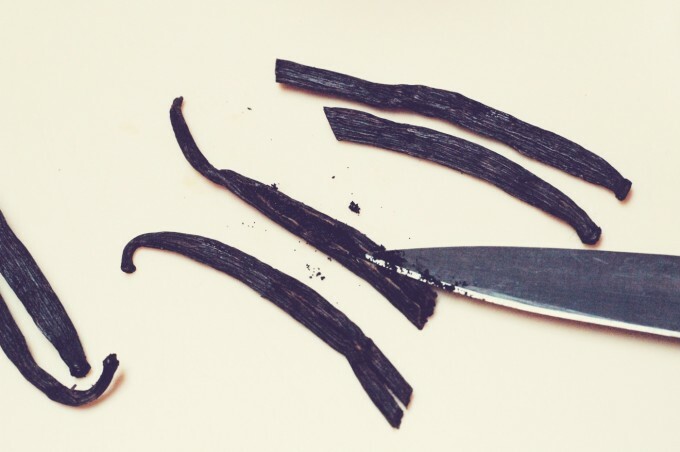 Making vanilla is worth it just for the smell alone. I had a pile of little ones on my lap after I wrapped up, just because my hands carried the sweet scent of fresh vanilla beans. This is one of the easiest kitchen projects you’ll come across and you reap the reward of a high quality product at a fraction of the cost of store-bought organic vanilla. This made great a great gift for friends and teachers last year and would make a lovely hostess gift. Let’s look at the cost breakdown. You really don’t need to use the amber bottles, and can use whatever you have on hand. In fact, if you’re making it just for yourself, you can go ahead and toss the correct ratio of vanilla beans right into your vodka bottle. Take off the $1.30 per bottle, and you are down to $3.20 for 100ml. Here in Manitoba, a local supplier carries organic vanilla at over $15 for 118 ml. Wow. On Amazon, I could only find 59 ml bottles, which retailed for over $10. Vodka – you can use any vodka – organic would be nice to avoid gmo ingredients, but use whatever you can get your hands on. You can also use other alcohols such as rum, brand, or bourbon. Bottles – we use 100ml amber bottles, as I like to give these as gifts over the holidays. You can use almost any kind of jar you have on hand, as long as it is clean and seals well. 1. 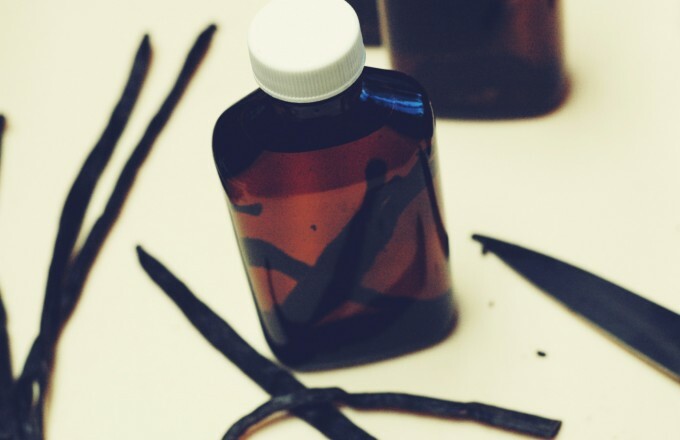 The ratio for vanilla is 6 vanilla beans per cup of alcohol (though I’ve heard as few as 3 per cup and as many as 8 per cup). I used 2.5 beans for each 100ml bottle. 2. Slice the beans lengthwise, just enough to open them up – not to slice them in half. This allows the vanilla flecks to get out and mingle with your alcohol. 3. Slice the beans in half if necessary to fit into your jars or bottles. 4. Place the beans in your jars or bottles. 5. 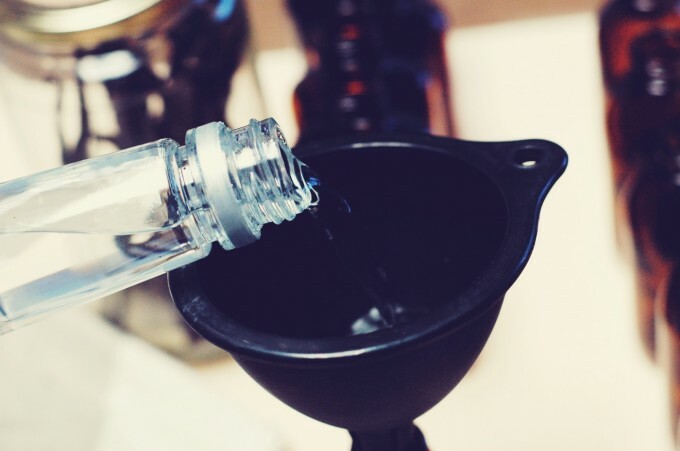 Using a funnel, fill the jar, leaving some air space, and seal. Place in a dark cupboard for 6 – 8 weeks, giving it a shake each day, if you think of it. Sampling is allowed. Ahem. 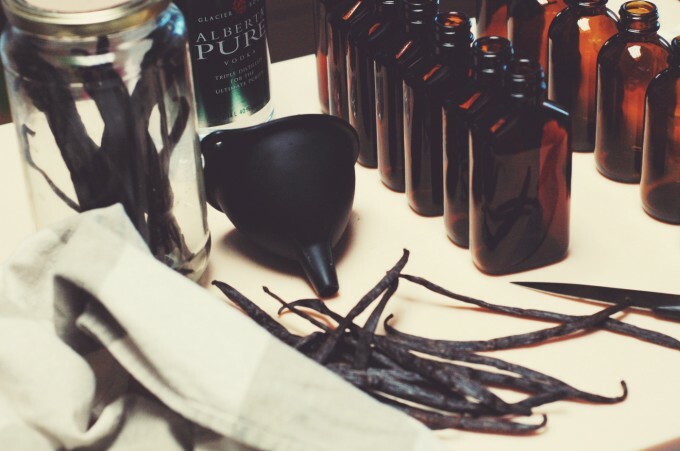 Once you’ve used up your vanilla, you can add more vodka to the bottle, and add scraps of vanilla beans if you collect them while baking – or just add another whole bean. 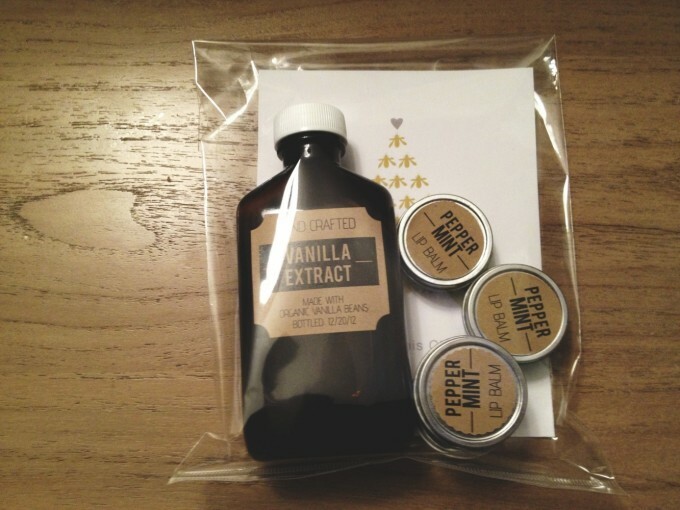 Vanilla makes a great gift. With a simple raffia ribbon or popped into a nice package, the bottles of vanilla themselves make a beautiful gift and require no fancy gift wrap. Print out our labels to make your bottles extra special. 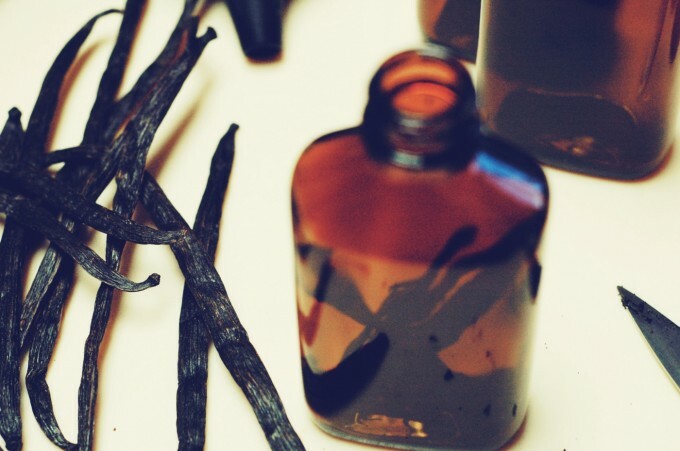 The front label has basic info, and the back has instructions for the person receiving the vanilla, so they will know how long to let it sit, and how to replenish it once it is used up. This post was featured over at Real Food Forager and Girl Meets Nourishment, and shared as a part of Thank Goodness It’s Monday, Natural Living Monday, Fat Tuesday, Simple Lives Thursday, Fight Back Friday, and Unprocessed Fridays. Hey – where do you get your bottles? We get them from Richard’s Packaging in Winnipeg. The ones we use are amber bottles – you can also do a general search online and there are likely other supply stores that carry them. This is great. The recipes I have always call for less beans, more vodka and sitting around for 4-6 months! Hi Carol! Yes, even this amount of beans isn’t that much in terms of cost, and why wait so long for something so good if you don’t have to? The 2 month wait is already enough. It’s actually good to start this project in September or October for use as gifts because of that, but I just tell my recipients how much longer they’ll have to wait – nobody has complained so far! I visited your site and right away your post on Homeschooling with Living Books caught my eye – something to read tonight! Thanks. You can find organic vodka and gin from Organic Nation. I got both at a Liquor store here in Oregon, USA. I was surprised to find them in regular liquor stores! (All Liquor in Oregon is sold only in Government run Liquor stores). the cost for the organic was pretty much comparable to other liquor, some was more, some less expensive depending on the brand. Thanks for sharing the info about Organic Nation, Carol! I have seen organic vodka here in Canada, but for a pretty penny. There is an Organic Potato Vodka at our liquor mart and it is regularly just under $50 for 750ml. Great that it is out there, though! I should also mention that I made vanilla about 30 years ago, using, I believe, Gin, then as well.. I actually forgot about it, but kept moving it with me each time I moved. Then just a few years ago, I “re-discovered” it. Wow! Was it yummy!!!!! It is almost gone now, so I need to make more. I can’t begin to tell you how wonderful leaving it for 30 years made it taste. This batch won’t be left for that long, guaranteed! Maybe I’ll hide one of my bottles tomorrow, so I can find it in the future. Thanks for the inspiration! How long does the vanilla last? I know you said it tastes great 30 years later. 😉 But is there an expiration date I should put on it?